The Genesis.XGi is the gravity fed version of two new airbrushes that showcase Grex's continued efforts in airbrush innovation; focused on ergonomics and adaptability. The defining design element is the ergonomic hand grip set (patent pending) that provides improved comfort and handling. 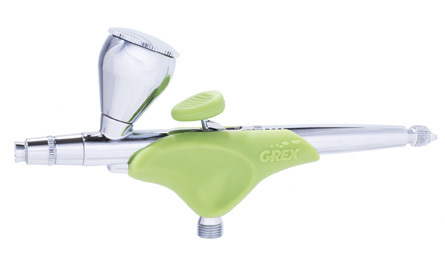 It is specifically engineered for maximum adaptability by leveraging the already wide selection of accessories available from Grex. - Interchangeable top mount reservoirs - use the perfect cup size for your project. - Inline top mount cups offer balanced handling of the airbrush. - Cup design allows optimal paint flow even when the airbrush is held in an angle. - Integrated paint cup is easy to clean and perfect for minute amounts of paint. Give your 0.3mm Tritium, Genesis.XGi, and XSi airbrushes the ability to spray in a fan pattern. Convert your Tritium, Genesis.XGi, and XSi airbrushes to a 0.7mm nozzle size or use as regular replacement parts.